I know that there are a number of online sites which allow you to create and host flash slideshows of your pics for free. 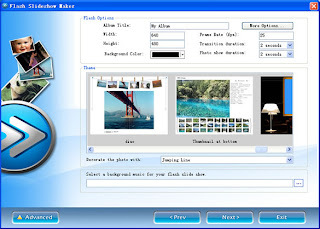 However,if you wanted a software that would allow you to make animated photo slide shows with the freedom to play them anywhere, then you might like Flash Slide Show Maker v4.12 (11.14MB). It converts your digital pictures into a Flash album in the Macromedia Flash file format (SWF) format. You can then burn the slideshow on CD or DVDs or host it on your website. This software is totally free for personal use. No spyware was detected.